Methane is also involved in a widely discussed, hypothetical, positive feedback process. 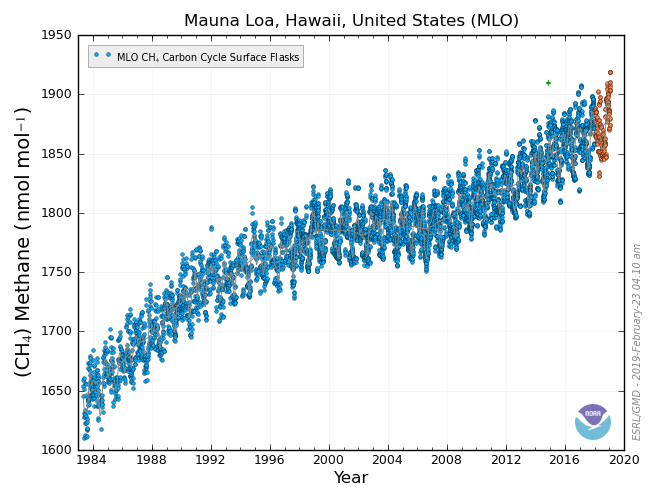 Various sources give the half-life of CH4 in the atmosphere as 6 to 8 years, which would make the average lifetime 1.4427 times that (because oxidation is an exponential process, rather than linear), yielding an average lifetime for a molecule of CH4 in the atmosphere of 8.7 to 11.5 years. Page 11 of this source gives the directly-calculated atmospheric lifetime of CH4 as ~8 years, but identifies a feedback mechanism that (they say) effectively increases the atmospheric lifetime of additional CH4 to ~12 years. Call it 8-12 years. That's pretty short. It means the only reason CH4 levels are as high as they are (about 1.86 ppmv†) is that CH4 emissions are already high. 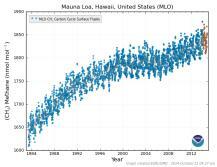 There would have to be a very large,&ddagger; sustained increase in CH4 emissions to cause much increase in long-term average atmospheric CH4 levels. †Methane levels vary slightly by location; this site has some maps. &ddagger;How large is “very large?” Well, for comparison, it would take about 3 Gt of CH4 to increase the atmospheric methane level by 1 ppmv.